After 23 years of consulting in Internal Medicine and treating disorders he decided that prevention of these disorders was the paramount direction he wanted to take. He became a member of the Obesity Medicine Association in 2000 and attends their twice annual conventions to stay current of new information on the causes and management obesity disorders. 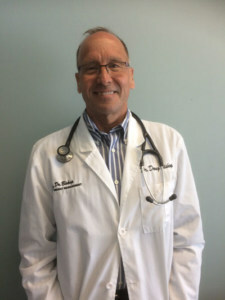 Using his knowledge of medicine and fitness, Dr. Bishop created his Weight Management Clinic in 2001 in order to develop and implement a spectrum of tools for nutrition, motivation, and fitness. His main goal is to guide individuals toward a long-term healthy lifestyle. Dr. Bishop is genuinely concerned about each of his clients and is passionate about his work. He not only has the desire to help people with the prevention of chronic disease, but to encourage and assist them to take charge of their lives and feel in control of their own health and happiness.